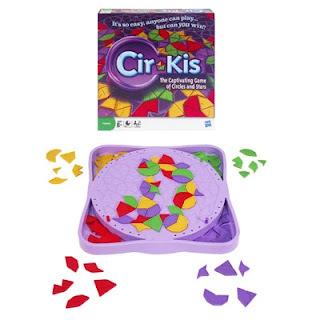 There's a great deal at Amazon* today: Hasbro's new family game CirKis is only $7.99 which is 60% off its standard $20 price. Jim, Ranger, and I first played CirKis at GenCon 2009. I expected a knock-0ff of Mattel's clever Blokus territory acquisition game; the tiles, the shallow grid board, and even the names struck me as similar. Instead CirKis reveals a very different mechanism and strategy despite the superficial similarities. In Blokus, players arrange luminescent tiles on a standard grid to acquire as much of the playing surface as possible. At the end of the game the winner is the player holding the most tiles. With CirKis the grid is a repeating geometry of stars and circles. The tiles are odd polygons varying greatly in size and shape. It takes more discernment to lay tiles, but there are still multiple options for playing each tile. CirKis exercises lateral, spacial, and strategic thinking simultaneously; that sounds complicated, but Ranger really enjoyed playing. CirKis' scoring is ongoing throughout the game. A player earns points when they complete a circle or star, and the winner is the first to reach 40 points. While Ranger currently needs help playing (at age 4), I don't think he's far off from playing independently. For now, he can happily play with it as a tile drawing toy (which helps develop his placement skills for future game play). The pieces are strong and plentiful, so this isn't something I'd want scattered all over the living room floor after the lights are out, but the game looks like it should hold up to regular use by children. We tried to buy a pre-release copy at GenCon, but CirKis was entirely sold out and even the demonstration copies were reserved. I'm actually glad we didn't get one then because I was able to get two for less than $20 with this current sale price. CirKis is a great game for families and adults. It scales nicely to different ages and abilities; while a preschooler can be involved with assistance it can also be very competitively played by adults. *Baby Toolkit is an Amazon affiliate, and we make a small percentage off purchases made after clicking through from our site. We're geek parents who LOVE games. We have no extra-consumer relationship with Hasbro or Mattel nor have we received compensation from them or their affiliates for this post. crud! I missed the sale! I will have to watch for it again!